In truth, this could have been 900 songs that should be in your gym playlist. 23 Ways To Lose Bodyfat Fast. If you are like me, things like pasta, bread, rice and potato can take up most of my plate. I could happily eat carbs all day. The problem is carbs are energy and if you eat more than you need it will make fat loss impossible. Try and reduce your portions a little at a time. If you usually have 5 big spoons of rice, try 4, then 3. It will make the transition much easier. Get more of these on your plate, you will also feel full longer. The more muscle you have the easier you will find it to lose bodyfat. Also It will make it easier to keep the bodyfat gone for good. 1 minute as fast as you can. What do you usually do? Ok, now the next time you work out do something different. It will challenge you in a way that you are not used too. Usually do cardio – do weights. Usually do gym – do a class. So when you think of fat loss everyone thinks cardio. Now I know cardio is important, but you can and will get sensational results from a strength training workout. Once my clients are up a to a decent level of fitness the focus is always on strength training to sculpt the body that you want. Ok, now I know this sounds like a lot of work and expensive. But it really isn’t. One of my favourite meals is chili con carne. A decent Jar costs about £2 and makes one meal. My recipe is so easy and has a nice kick to it. That totals at £3.21. The spices and stock cubes will last ages. So next time you make it, it will cost you 41p. You don’t even need to be able to cook. If you cook the mince like you would normally, just throw everything in and stir it. That is pretty much it. If you need more guidance, just YouTube it and you’ll get millions of time and east to follow videos. Water is always the answer if the question is anything to do with being healthy. Just drink more, it will flush out the rubbish in your body and improve your digestion. One Exercise – Kettlebell Swings! These will work your whole body; they will also get your heart pumping. As all-rounder exercises go, they are right up there. I think they work great for high reps, anything from 15 upwards. Claim your fitness pass to our awesome centres. You might be smashing your workouts but even if you do one hour 5 days a week that still leaves a lot of hours left. Now I’m not saying to do double workouts. But being generally more active in the day can make a huge difference to your overall results. Walk it. We can all be lazy for driving somewhere we should really walk to. You’ll save money too. Get on your bike, a pushbike is a really quick way to get around and your legs will thank you. 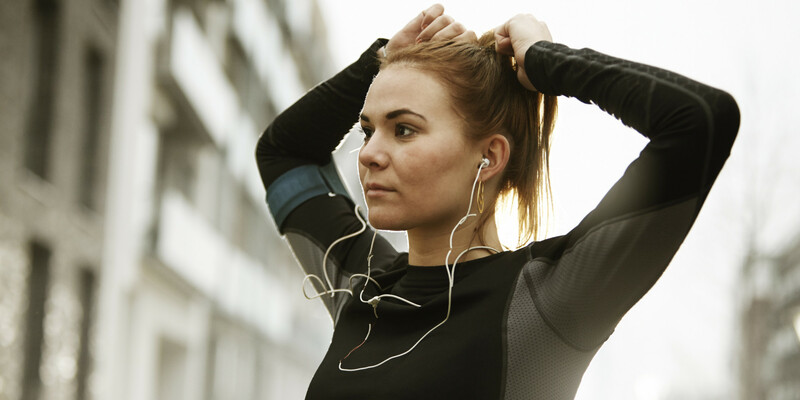 The right kind of music can make your workouts much more energetic. Some people love chart music, others love dance music. Me, I like a bit of everything but pop punk like blink 182 works for me. If you can’t fit as much on the plate you will eat less. If portion control is your challenge this could be the tip for you. We have all done it. Got held up at work, got in late, nothing in the fridge and you are super hungry. What do you do? Probably pick up the phone and get a curry, or a pizza. But while you’re at it you might as well have a real treat. So chips, garlic bread and big bottle of coke get added. But you have spent over £15 so you get the 6 mini doughnuts. If you plan your meals and prep or even just make sure you have the ingredients in the house. You will be much more likely to succeed. Because you will buy everything! Circuit training is a great way to work out. It is so versatile you can do it at home, in a gym, or in a class. You can do it with no equipment, or a full gyms worth of kit. You won’t be doing anything long enough to get bored as you’ll be onto the next exercise. Just by adding something like a plank in between all your exercises for a workout can increase your calorie total. You’ll also be getting some core work in without adding time to your workout. Sometimes you can have too much time. If I get up nice and early for work, I tend to make breakfast, watch some tv and play on my phone. The problem is, because there is a lack of urgency I am not as productive and end up being late. Workouts can be the same. Set a 30-minute timer when you walk in the gym and crack on. You’ll be surprised how much you can get done. Having someone to keep you motivated can make an enormous difference. If they are slightly ahead of you in terms of fitness and knowledge, even better. Forget 30 minutes on the bike, get warm then just let rip for 2 minutes. Give it everything! We all know we should, but we don’t. Try and get some more veg on your plate, it will really help with fat loss and overall health. Don’t stress about losing weight/fat. It will happen! It may take longer than you want it too but it will happen as long as you don’t give up. 50kg – Do as many reps as you can. 40kg – Do as many reps as you can. 30kg – Do as many reps as you can. All without taking a break. These sets are a great calorie burner. Supersets are where you pair 2 exercises together. Either that work the same muscle or apposing muscles. Chest Press and Press ups. They are a great tool to make the most of your time and burn calories. Why not get started with a 5 Day Fit Pass. Click the pass below to claim a free 5 day Fitness pass you can use at all Your Leisure Centres. Ageless Thanet’s Culture Club needs you!